Email delivery is an outcome easy to take for granted, but the objective industry experts at 250ok have measured that 28% of all sent email is rejected by receiving systems or lands in the spam folder—in other words, with most email delivery options, more than one in four emails never arrives in the inbox! That’s an astonishing failure, when you consider the real-world impact of undelivered messages—missing revenue, decreased customer engagement, and operational inefficiencies. Ignoring message deliverability quite literally means leaving money on the table. At SparkPost, we routinely see happy customers enjoying a significant lift in their deliverability by up to 10%—it’s clear that the difference in performance between SparkPost and also-ran service providers yields hard, bottom-line benefits. What is deliverability worth to your business? A lot. There are big rewards in improved email deliverability. 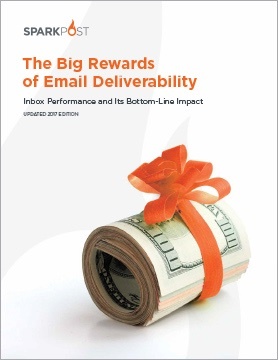 Download our executive brief, “The Big Rewards of Email Deliverability” for the latest deliverability data and to learn more about how inbox performance drives revenue impact.